The timestamps on today's photos don't lie. Welcome to dinner at the Townhouse. The pre-game typically kicks off with a bop to the head. 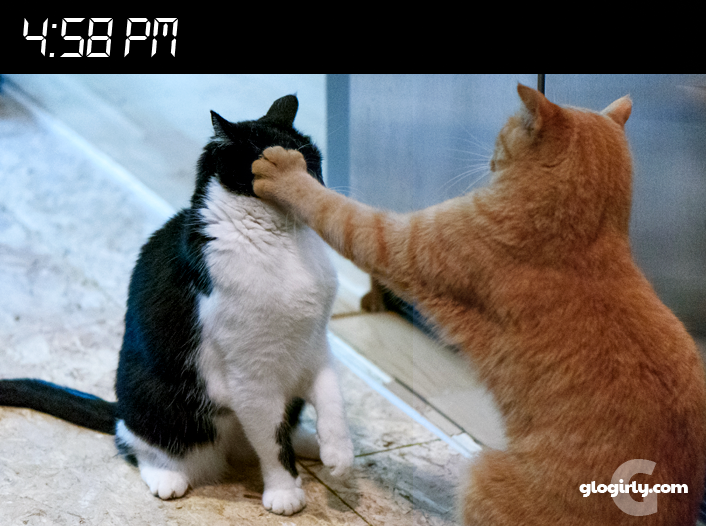 Waffles is usually the instigator, though Katie is quick to turn things around with moves even the great Muhammed Ali would've been proud of. 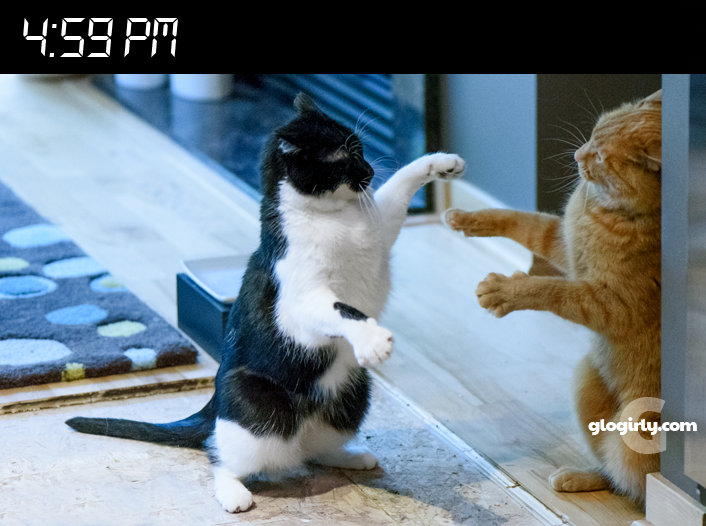 While Glogirly is dishing things up, Katie & Waffles waste no time getting in a few rounds of Patty Cake. But last night, the post dinner game shocked everyone. What??? Katie & Waffles cat loafing a mere 12" apart? Either we need to go buy some lottery tickets, or prepare for the apocalypse. This happens between me and Binga at breakfast time, but not dinner. I don't know why she does this - I think it is kind of dumb, and it took her a long time to get me to play her game. Apparently, Sparkle didn't consider it a game. Thank goodness your breakfast was on the way to calm you both down. Aw! They are so cute sitting together! I saw their boxing video the other day and thought it was pretty cool to see them in action. A full belly always helps calm things down. That is soooo funny and cute. One of these days I expect to see them in a cuddle pile for a nap! Full tummies make it harder to get motivated and find separate lounging locations? We're glad we aren't the only ones with Sleepypods on the furniture. Breakfast anticipation... A cat can get a little cranky when food is slow to arrive. That's how it works around here too. We've learned that a full belly makes everything better. Growing up, dinner had the same effect on my younger brothers. OhMyGosh..That is really funny Dorothy..lol..
Oh yes, everything is better on a full belly. MOL! We sometimes have slappy paws at our house before dinner. You two sure do have fun at dinnertime! ka-POW! Biff! BAM! and then.... MOL! The smacky paws happen here while I am dishing out their dinner..I guess they are afraid someone is going to get more..
oh God it looks like our house!!! lol! Love it! 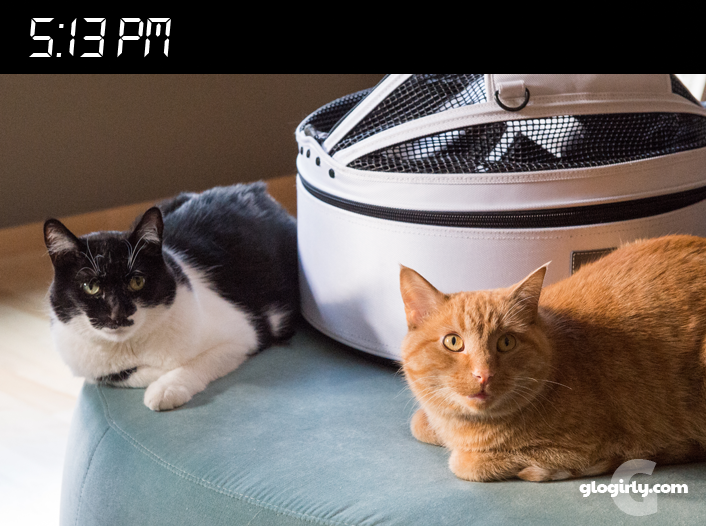 You know, maybe their journey to BlogPaws made them grow closer? That first picture just kills me! MOL It's a kitties purrogative to change their minds. After dinner relaxation. Tummies are full and you don't do a smack down on a full tummy! I guess bellies were too full for Patty Cakes.